Around 7 p.m. n Sunday, a 20-ounce plastic bottle containing dry ice exploded in a Terminal 2 restroom. The dry ice bomb did not injure anyone, nor did it cause damage. But, airport officials suspended operations in the terminal and delayed flights until about 8:45 p.m. as the bomb squad responded. In May, a dry ice bomb temporarily closed Disneyland’s Toontown. CBS L.A. is reporting that they found two more last night (Monday) in other areas of airport. They don’t suspect terrorism, because they are in areas that require badges. Hmm. Dry ice is not flammable or explosive, but it exerts pressure as it changes from solid dry ice to gaseous carbon dioxide. If dry ice is placed in a seal container, there is a risk of the container rupturing or of the cap rifling off of the container when you open it. 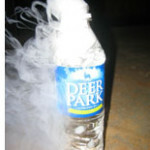 A dry ice bomb produces extremely loud noise and shoots out pieces of the container and dry ice. You could harm your hearing and become injured by the container. Pieces of dry ice could become embedded in your skin, giving you internal frostbite. To avoid these dangers, don’t seal dry ice in a bottle, jar or locking cooler. It’s fine in a paper bag in your refrigerator or freezer or in a cooler without a tight seal. A great way to tax the system of security we currently have… should some dubious individual or group wish to do that. Glad I don’t fly anymore; the TSA sealed that deal for me. Wow, you take this news and then, injecting questionable logic, use it to blame our government. I point this out because its a perfect example of what is wrong with our society–an overwhelming tendency to want to shove all responsibility onto the government and then at every opportunity criticizing the same government for the manner in which it deals with the burden pushed onto it. You don’t fly because of the TSA? Old age, fear and bombs don’t deter you, but the TSA does? At that is because….? First, not all of us wanted the government to take on this “responsibility” and we are probably the most vocal of those criticizing the way they do it. Even among those that initially were asking the government to take on the responsibilities to which you refer, many have changed their minds because they either didn’t think things through early on or because they didn’t see the government responding to their requests in the way they anticipated. Either way, they have a right to oppose the governments methods and even to reconsider how much the government should be doing. Second, I too avoid flying due to the TSA. I might do so if I have an urgent need to travel far on short notice but I won’t do it if I can avoid it. This probably cost me over $500 in travel expenses this year because of the time and vehicle costs for a trip. Why? It is not because of a “fear” of the TSA in the sense you seem to imply. My main fear of the TSA is as a step toward a modern-day Gestapo or KGB. (“Papers please!”) I do so mostly because I strongly object to the whole transportation security theater mentality and the accompanying assault on individual privacy and dignity. I say do airport security the way the Israeli’s do. They are in the thick of it and no major problems. Oh and they move people through fast and no long lines. You mean that dreaded, evil, racist, homophobic, bigoted PROFILING?! Do you know how many names we can all call you (so we feel better about ourselves) now? Just because it TOTALLY works doesn’t mean we don’t get to call you a hater! Excellent reply! I’m glad not everyone fears there’s an anarchist every time government is called into question. I was going to also reply saying something along the lines of, “I’m ‘shoving’ the responsibility to the government because they stepped in and took it without asking, so yes, they are the responsible party…” However, you said it much better than I could!